Presented by Izzie Clarke, Katie Haylor. Neurodegenerative diseases like Alzheimer’s are incurable conditions which cause the degeneration or death of cells in the brain, and can result in deterioration of movement, memory and cognition. Scientists are desperately searching for a cure - but we still don’t know what causes it in the majority of cases. Now, a team at the University of Cambridge have used a new technique to discover the mechanism behind the development of these diseases. Georgia Mills spoke to Patrick Chinnery, professor of neurology at the University of Cambridge. Patrick - Late onset neurodegenerative diseases like Alzheimer’s disease are on the increase because as the population gets older, more and more people are suffering from these disorders. And the truth is, we don’t know the cause in the majority of cases so we were keen to try and work out whether or not some new genetic mechanisms might be responsible for some of these problems. In 99 percent of cases there’s no family history, and we don’t quite understand the cause in those patients. It might be partly environment and it might be partly some genetic risk factors and we were keen to explore a new genetic mechanism by studying the brains that we’d collected from patients who’ve died from these conditions. Georgia - Right. So how did you investigate these brains? Patrick - We took advantage of a resource that the medical research council has been investigating for decades actually. These are brains that people have donated for medical science and research, and we identified about 50 of these brains partly from people affected by Alzheimer’s disease and another kind of dementia, and also some healthy brains that had been given by people who’d died, for example, from a road traffic accident who weren’t suffering from the condition. And we developed a new technique that allowed us to look at the genetic code in extreme detail across bits of the genetic code that we know can cause Alzheimer’s disease and related conditions. And what we found is that almost all of these brains were containing spelling mistakes in the genetic code affecting some of the cells in the brain. We found these all over the brain when we looked, but not all the cells in the brain were affected, only a small proportion of the cells were affected. In fact, the technique we developed, for the first time allowed us to do this on brain tissue. Georgia - Could you tell me a bit about that technique? Patrick - Essentially, what we do is we sequence a bit of the genetic code, the DNA, many times over, and this study we sequenced it 5,000 times in each sample of the brain that we looked at. And that allows you to look for very rare genetic changes that you wouldn’t detect if you only sequenced it perhaps 2 or 3 times. Georgia - What has this told us the fact that these spelling mistakes are appearing in certain cells but not all of them? What can we take from this? Patrick - Well, what we’ve learnt from this that, contrary to what people previously thought, which is that the genetic code in your brain and my brain is all identical, actually there’s a lot of heterogeneity, a word we’d use to describe that is a mosaic, so there are all sorts of different genetic variants in the cells in our brain. Now some of those might be completely innocent and not cause any problems, but by measuring the frequency with which they occur, we can make some predictions about how likely it is that they’d affect a bit of the genetic code that could predispose to a disease in one of the cells. And if that happened to enough cells iot could contribute to something like Alzheimer’s disease. Georgia - So when do we think these mistakes are happening then? Patrick - The thing about the brain is that the cells generally don’t divide, so they're not being copied because they’re set in place when the brain develops in the womb. And the pattern of the genetic changes we saw suggested that actually these spelling mistakes had occured when the brain was being formed as the cells were being copied and divided to grow from a simple embryo, which is a ball of cells into something more complicated with a brain structure itself. Georgia - And this would explain why some areas of the brain are slightly different if these mistakes happened when some of the brain had already sort of formed? Patrick - You’ve hit the nail on the head exactly. If you could imagine, in very simple terms, ultimately the brain derived from a cluster of cells, when we’re actually fully formed we have 100 billion cells in our brain, so you can imagine this is a branching tree-like process as the cells divide and form more and more daughter cells. And depending on when the spelling mistake occurred would determine how many of the cells were affected. If it happened really early, most of the cells would be affected; if it happened really late, only a few of the cells would be affected, and what we saw in our experiment was that all these possibilities were occuring. Georgia - Now we’ve discovered this mechanism, is there anything we can take forward from this that might give us insights into one day treating it? Patrick - I’m sat here talking to you know and I know from this work we’ve done that I’ll have spelling mistakes in different bits genetic code in my brain. It doesn’t really change the fact that those were there before we discovered this was happening, so I don’t think it has a major impact now on how we would diagnose or treat people. But by getting these insights I think it’s given us a clue as to the mechanisms. And I thinks that’s important because it may be that using an adapted version of this technique we might be able to help diagnose these conditions at an earlier stage. That’s really important because I think the field generally agrees that the sooner we intervene with treatments, the more likely they are to be effective. And by understanding the mechanism, of course, we can start to develop treatments targeting that particular mechanism that the protein that’s altered by the genetic change, and thereby move to a position where we have actually got effective treatments which, unfortunately, are not there at the moment. How can you plan for the future of humanity? Technology, society, and even the climate seem to be changing at unprecedented rates, so how do we prepare for an uncertain future? This tricky topic is being tackled in a new book, called - On The Future - by Professor Lord Martin Rees, the astronomer royal, who joined Izzie Clarke in the studio. But how far into the future can you try and plan? Martin - Well, of course, we can’t predict on Earth as confidently as in the heavens, but I think there are a couple of things we can predict at least 50 years ahead. One is that the world will get more crowded. The world population’s going up, mainly because people are living longer and because the birth rate is high in Africa and parts of India. So we can predict that the world population, by 2050, will be about 9 billion and that means we’ll have more people to feed and they’ll be more demanding of energy and resources. And that leads to a second prediction which is that because of all those things, it’s almost certain the world will be warmer because the carbon dioxide concentration: it is going up, will almost certainly continue to go up, and there’s a big time lag in its effects so almost certainly we’ll have to contend with a changed and warmer climate. Izzie - Absolutely. So are those major threats to our natural planet? Martin - Well, that’s right. Of course, because I’m an astronomer people think do I worry about asteroid impact etc. They can happen but they’re rare. What is worrying about the two things I mentioned is, as you said in your introduction, the rate at which things are changing because of expanding populations and because of advancing technology. Izzie - And in your book you also mention the report of the Intergovernmental Panel on Climate Change who recently announced their recent report, so how important is this? Martin - Well, I think there’s a risk that if the temperature rises we might cross so-called “tipping points” when some really serious affect happens. And we’ve got to think not just about 50 years but about what will happen at the beginning of the next century because any baby born now is quite likely to be alive in the early part of the 22nd century. So we’ve got to think about how we can pay an insurance premium now to reduce the risk which otherwise would be encountered by those who are recently born. 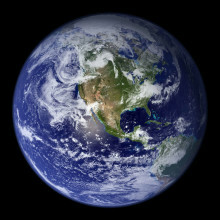 I would say that if we want to deal with climate change, then in my view the only effective way will be new technology. I’m rather sceptical about whether politicians will agree to cut carbon for the benefit of people 50 years in the future in remote parts of the world. But I’m slightly less pessimistic now, and I think we do have a future. And what I say in this book is that the best solution to the climate problem is to accelerate research and development into all forms of clean energy. Because if we can have carbon-free energy which is developed fast and cheap, then countries like India, which certainly need to have more power. They will not be able to afford to have anything other than coal fired power stations unless the cost of renewable energy comes down. So if it comes down they can leapfrog directly to clean energy. That’s good for them and good for the country which developed the technology. Izzie - Absolutely! So if we can get that technology, a lot of us are living our lives online, is there any chance that even that can take over and perhaps go in a negative direction? Martin - It’s a worry because I said we could predict some things 50 years ahead, but what we can’t predict is technology, because smartphones and the internet would have seemed magic, even just 30 years ago. So if we think about 2050 and beyond, we can’t be confident of whether there’ll be some new breakthrough. And, in particular, I discuss in my book two technologies - cyber and bio, which offer huge benefits but also they present serious risks. And the reason they do that, is that it’s possible for just a few people, by error or by design, to have an effect that cascades globally. We know about cyber attacks and how catastrophic they can be, and we’re going to be more vulnerable in that way. And also possible misuse of biotech can happen in the same way. So I think we need to be concerned about those two technologies. Izzie - And when we talk about biotech, what do we mean, what does that encompass? Martin - Well, of course, we know we will have gene sequencing, and maybe gene synthesis, which will allow us to do certain things which you may feel are ethically or prudentially not a good idea to do. But also we have the risk that there will be some experiments that go wrong. About 5 years ago, peopled did experiments to show that you could make the flu virus more virulent and more transmissible, and the American Government stopped funding these experiments because obviously they’re risky, and there are other experiments like that. And whereas 50 years ago when molecular biology started there were just a few labs and they could regulate themselves. Now these technologies are global there are strong commercial pressures. And I really worry because if you want to try and regulate them, but regulation can’t be enforced globally in my view effectively because of these pressures, anymore than the drug laws or the tax laws can. And if you ask me what keeps me awake at night, it is the misuse of cybertech and biotech. Izzie - Okay. So very quickly, what do you think we need to do to make sure the future of our humanity has a positive outcome, because the book itself is quite optimistic? Martin - Well, that’s right. I think there’s a big gap between the way things could be and way things are and technology has a huge upside, but to go with that there are risks. So I think awareness of these things, and ensure the benefits of these technologies don’t just go to an elite but are widely spread. And, in particular, that they go to the countries like Africa where otherwise the population may run away and there may be real pressures. On The Future is out NOW in hardcopy and audio book. Tamsin - I remember at school a friend told me that blood is blue until it is exposed to air when it turns red. Looking down at my wrists and seeing those blue lines I had no reason to doubt them. But like almost everything you hear in the playground, it was complete nonsense! Human blood is the same colour whether it’s inside or outside your body - and that’s red! The colour is brighter when blood is full of oxygen and darker red when it is oxygen-poor. But it’s definitely not blue! Blood is our internal delivery system. It takes nutrients and oxygen all around the body by a super-speedy highway known as arteries. And then takes waste products like carbon dioxide away through the veins. Our blood is made up of cells floating in a liquid called plasma. Blood plasma is predominantly composed of water, but also contains proteins, sugars, irons, hormones and carbon dioxide. The cells we have in our blood include the little doughnut-shaped red blood cells which carry oxygen, white blood cells which fight infection, and platelets which help the blood clot, stopping it from endlessly pouring out of our bodies after a cut. Interestingly, our blood also contains small amounts of some metals, even expensive ones like gold. The colour of blood is determined by the protein in the blood that carries oxygen around. In vertebrates like us, the colour comes from a protein called haemoglobin. This protein contains iron, which makes blood bright red when it’s stuck to oxygen and dark red without oxygen. Different proteins lead to different blood colours; for example, cut horseshoe crabs and they bleed blue, whilst sea squirts disgustingly have a mustard yellow coloured blood. Other weird and wonderful sea creatures have fabulously vibrant blood colours such as green, purple and pink. So why does our red human blood look blue in veins close to the surface of our skin? Well, the size of the blood channel, the oxygen content of the blood, and the thickness of the skin above the channel affects how visible light travels through skin, which is known as absorption. And these aspects also affect how much light can escape or be scattered, changing the colour we see. The oxygen-poor blood in our veins is best at absorbing red light, but blue light cannot reach deep into the skin. So a shallow vein appears blue because this colour is reflected back at the eye. We cannot see our arteries because they tend to be smaller and have thicker walls than our veins. Hopefully, this misconception was not in vain, and you’ll remember that, unless you’re a sea squirt, our blood is always red. Bees are critical to our continued existence. They pollinate our food, taking pollen from one plant to another, allowing them to reproduce. Without them, humanity would, quite frankly, begin to starve. So anything that helps them is welcome. A company called Oracle technology, in conjunction with the World Bee Project, have created a system that pools the data of sensors into one, big, accurate database, keeping beekeepers up to date - talk about a hive mind! Adam Murphy spoke to John Abel, Vice-President of Cloud Technology for Oracle UK, Ireland and Israel. Turns out we have a lot to thank bees for! John - If you look at the world we have today, the critical element is food for the growing population. One third of our food is actually down to pollination and the pollinators. 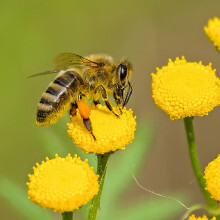 The honey bees is one of the key resources that do pollination. The problem is in England alone between 1985 and 2005 there’s been 54 percent reduction in those pollinators. Adam - And could you tell us then about the tech you’ve developed to help them out? John - So on our hives that we have here at Oracle, Reading, we have the ability to capture sound, we have the ability to capture humidity, the weight of the hive, and also we can look at the external factors like weather and rain. What this means is the ecosystem of the hive, specifically sound which is the exciting one, we’re capturing and putting to the Oracle cloud. If you think about it, two hives give us a good set of data. But more and more hives that add on top of the World Bee Project hive network allow us to grow an ecosystem where we start seeing on mass how hives are happy or unhappy depending on the environment they live in. So we can start seeing very quickly how to inform the beekeeper of where to place the hives for the best impact to yield great honey, but also to have great pollination. Adam - How do we get from the data you have to actually helping the beekeeper? How do we apply the results that these sensors give us? John - What happens in the first instance is we can give scientists data on mass, and using this new technology we can start looking for patterns in the data. So we could start actually indicating to multiple beekeepers is there a threat in your area? So it could be there’s a hive in the area that's been attacked by Asian hornets so it would be good to inform other beekeepers that’s happening somewhere else so they can be ready to react. Maybe there’s a disease, so again, informing other beekeepers there’s a disease means they’re ready to act. We can intelligently tell the beekeeper about what’s happening around them or around the hives in their area. We can also tell them about their hive if someone is, let’s say, lifting the lid when they’re not there because the weight sensor will have a drop of weight. We can tell from the sound if the bees are going to swarm, which means they could leave the hive. This can instantly be passed to the beekeeper. And also, when people do building applications for new blocks of offices like the one I’m standing in at the moment, in the future we can give them what’s the ecosystem that will benefit pollination. So there’s huge ramifications for this data to be shared and used for growing our food resources, protecting the bees, and making our landscape a lot more eco friendly. Adam - Does this sensor when it goes on the hive, does it bother the bees at all - is it intrusive? John - I mean it’s the size of a matchstick if you think of the end of it, so it’s very small. The bees don’t really know what it is, it’s so in the corner. Adam - Is it expensive this system or can anyone feasibly get it for their beehive? John - Compared to the cost of the hive they’re actually a lower cost than you think. And actually we hope, as people get more and more into this scheme that they start adding their data onto the Oracle cloud, it will come down in unit price. One of the other things that I have a personal vision for is, wouldn’t it be fantastic if schools had the ability to create their own Raspberry Pis or micro bits, and they worked with their local beekeepers to put their own sensors on there and add their own devices. A lot of these are very low cost to acquire. You could build it with a small amount of knowledge and that would be a great way to collaborate and, obviously, people being educated into why pollination and the pollinators are so important. Enzymes, nature's catalysts, are essential for life. But what are they and how do they work? Ljiljana - Everywhere around us and also in our body there are continuous chemical reactions happening. That means that one compound is transformed into another compound. And this one sometimes goes fast, sometimes slow, and requires energy and special conditions, and catalysts are actually compounds that help these reactions happen and go faster and more efficient. Izzie - Okay. So how do they work exactly? Ljiljana - So, for example, in nature we have catalysts and they are called enzymes. They are made of smaller elements; they belong to the class of proteins, and they basically lower something which is called the activation energy of a reaction. That means every reaction, like every two people in a party, they need a certain activation energy to talk to each other. Compounds need this activation energy as well. And enzymes are mediators, they lower this activation energy so that compounds can come together. Izzie - So where do we get these enzymes? Ljiljana - So, for example, we have them in our mouth, we have them in our body. They are everywhere in nature. So if, for example, you had some potato or pasta for lunch today, the first thing that would happen when you put them in your mouth there will be an enzyme that will degrade the large compounds which are in potatoes into the smaller sugars, and then it can travel around the body. Izzie - So that’s all in our mouth, in our saliva, and that’s what’s there? Ljiljana - Yes. And then there is in the stomach, liver is absolutely full of different kinds of enzymes because liver is basically helping us to keep safe and healthy, and it’s a cleaning organ of our body. Izzie - Okay. Now I’ve noticed you’ve got some beer with you as well. Izzie - So tell me what does this have to do with catalysts? Ljiljana - Well, usually in a beer is made of cereal and barley is one of them. 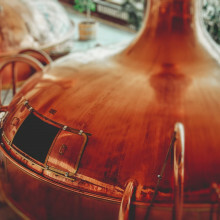 And barley has lots of different compounds which need to be degraded into the smaller elements and also alcohol because beer contains alcohol and different aromas, and to help us to do this we usually take yeast. Yeast has lots of catalysts, lots of enzymes to do that. Izzie - That just speeds up that reaction? Ljiljana - Speeds up the reaction and makes it go much faster than usual. I have a very special beer here made by an artist and it doesn’t use yeast, but it uses saliva. This is an artistic project. She claims that there will be a character that you can feel in this beer. And basically the enzymes for saliva are used to transform the compounds into the alcohol. And I think we should try some. Izzie - Okay. We’re going to do this. So instead of having yeast, we’ve got saliva to ferment this beer? Izzie - Okay. Let’s give it a go. Ljiljana - And so this is beer with a character. So let’s try some. Okay. Izzie - Oww woo. The beers just sort of gone everywhere. Ljiljana - This is very good - the character is all over the place. Izzie - I mean, that’s certainly one way of putting it. Katie - Go on then, pass some over here. It’s quite cloudy isn’t it? Izzie - It looks more like cloudy lemonade. Ljiljana - Yes. It is cloudy because it has lots of small compounds which are transformed with the help of the catalyst and so it’s very organic as well. Katie - It smells interesting. Izzie - Here we go. Katie, cheers. Ljiljana - Who's going to be the bravest? Katie - I think it’ll be Izzie. Ljiljana - You see, it’s kind of refreshing. Izzie - Umm. I mean that’s certainly one way of putting it. I wouldn’t say it’s a beer essentially. It doesn’t taste like beer. Ljiljana - Yes, exactly. Beers can have different aromas as well. So this would be a little bit lighter, although it’s a Brazilian donor. Izzie - How has this actually been made? How do you get a few products? So someone just spat into a bottle, what’s going on? Ljiljana - The artist that made this, Clarissa, the beer has used a similar principle to how you would basically brew anything else. So she used cassava as a main ingredient. For beer we would use barley or any kind of of cereal. And then she added a little bit of sugar to it. If we use a good barley we don’t necessarily need sugars because there are already some kind of sugars in it, and then she added saliva. And saliva is full of different enzymes that can cleave the cassava ingredient into smaller pieces, and one of the smaller pieces will be also alcohol. And there will be a little bit of an aroma and there will be also a little bit of bubbles, you notice? Izzie - Yeah. I did notice that, it was fizzing away. Ljiljana - Yeah. So bubbles are CO2 or carbon dioxide which is also produced in the reaction. Izzie - Okay. So where has this saliva come from? Ljiljana - All of these molecules are important for our psychology, so they determine our mentality, our character because they regulate the production of hormones in our body. That means they control a little bit of our feelings. She got four volunteers to give the saliva so you can have four different beers. Currently, this is the only bottle in the UK. Tamsin - Have you ever thought about what comes out of your car? We often hear about the nasty effect car pollution has on the environment, but is there anything we can do to reduce it? Chris - Hello. My names Chris Morgan and I’m the Technology Director for Johnson Matthey where we develop catalytic converters. Tamsin - How much of an issue is air pollution? Chris - Particularly in cities where there are high concentrations of particulate matter, soot and oxides of nitrogen in the air, that can cause problems with people with respiratory diseases and asthma, so it’s important that we try to clean those emissions up to improve people’s health. Tamsin - So what comes out of our cars? Chris - You inject a mixture of fuel and air into the engine. And that doesn’t burn completely cleanly so you get unburnt hydrocarbons from the fuel, you get carbon monoxide, and with any high temperature combustion process you get oxides of nitrogen formed as well as soot from both gasoline and diesel vehicles. The catalytic converter is important in terms of reducing that pollution to lower levels and improving the health of everyone in those urban environments. Tamsin - And how can you test for these things? Chris - We make development catalysts and we fit them onto vehicles, onto engines, and we measure how effective they are. Tamsin - And can we go and see this? Chris - Yes, I’ll take you to the lab now. Chris - Yes, so if you look through the window here we’ve got a passenger car sitting on a rolling road. So there are big metal rollers underneath the ground that the vehicle sits on, and when the test starts those rollers will turn round and that will simulate the vehicle driving along the road. We have a big fan that sits in front of the car to help keep it cool while it’s running the test, otherwise it would overheat. And then at the rear of the car we’re collecting all of the exhaust and taking it through to these analysers behind us where we can measure the concentrations of the pollutants that are being generated. Tamsin - As the test started an array of numbers flooded onto the screen. Chris - We are measuring what’s coming out of the engine and you can see different gases. We’re measuring hydrocarbon, carbon monoxide, oxides of nitrogen, and quite high levels. You can see coming out of the engine we have thousands of parts per million hydrocarbons. 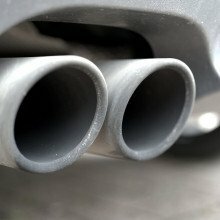 Tamsin - Essentially, there are thousands of polluting molecules coming out of our car all the time, but could a catalytic converter change all that? Chris - This catalytic converter is based around a ceramic honeycomb which sits within the exhaust of the vehicle and has thousands of small channels running through it. And what we do at Johnson Matthey is we apply coatings onto these channels that help to reduce the pollutants that are passing through the unit. Tamsin - So you’re holding one of the catalytic converters now. So this is like a cylinder and it’s about 15 centimetres in diameter and about 20 centimetres long. It looks quite big. Is this the normal size? Chris - For a passenger car, yes. Typically, the size of the catalyst relates to the displacement of the engine. Wherever possible, we get it as close to the engine as we can, so if you look in the engine compartment they are often located just downstream of the exhaust manifold that comes out of the engine. Tamsin - So we're looking at the screen here and we can see lots of horrible things coming out without a catalytic converter. But what happens when we do have the catalytic converter? Chris - Yes. So if you look at these two sets of numbers, what’s coming out of the engine, we’ve got hundreds or thousand parts per million of these pollutants - the hydrocarbon. And then we measure at the end of the exhaust system, behind the catalyst, then that number is down into single figures. So we’re converting a very high proportion of the pollutants over the catalyst. Tamsin - You heard right. A catalytic converter can take over a thousand molecules that are harmful to the environment and reduce them to just one or two. But how? Chris - Within this honeycomb, the coating we put on contains precious metals, so typically platinum, palladium and rhodium. And those form millions of tiny islands within the coating and when the pollutants land on those precious metals, that helps to react them with oxygen and convert them to carbon dioxide and water. Tamsin - And why do you use this honeycomb structure? Chris - Because you need to have the maximum interaction between the gas and the active component. So by having these thousands of channels, and coating applied in those channels, there’s a much shorter distance for the gas to travel to hit the active part of the catalyst and for the reaction to take place. If you just coated the outside of the pipe, a lot of the gas would just go down the middle and never touch the catalyst. Tamsin - How would you know if you need to get your catalytic converter changed? Chris - Hopefully you should never need to get it changed. They’re designed to last for the lifetime of the vehicle. The legislation says they should last at least ten years or 160,000 kilometres of driving. But all modern vehicles have a diagnosis system that monitors how well the catalyst is working and if it detects a problem then you get a warning light on the dashboard, and you need to go to the garage and get it checked. Tamsin - And what next? What can we improve on? Chris - The big change that’s happening at the moment is not just testing the catalysts in the laboratory under defined test cycles, but making sure that they work under a much wider range of conditions out in the real world. So we’re now not just testing catalysts on vehicles in the laboratory, we’re fitting them to cars with a portable analyser system strapped onto the back of the car. And we’re driving out in the real world, in winter, in summer, seeing real traffic conditions and making sure the catalysts work well under all of those driving styles. Catalysts can be used to make synthetic liquid fuels which release less pollutants than conventional oil-derived sources. Using metals to speed up reactions has revolutionised the way we make things on an industrial scale, from plastics to fertilizers. Without them it would take months or even years to get your end product! An industrial example is the production of synthetic liquid fuels. We currently use petrol or diesel in our cars, these come from natural oil reserves, but burning these releases lots of harmful chemicals as we heard earlier and they could one day run out. Instead, we can use catalysts to artificially make cleaner fuel to power our cars or even aeroplanes without releasing as many nasty gases. Katie Haylor spoke to Professor Robert Tooze who is an expert in synthetic liquid fuels and currently directs Drochaid research services in St Andrews. 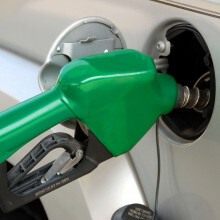 Robert - The majority of fuels that are used now to power vehicles come through oil from oil refining. So this process is breaking down large molecules into the products that our cars run on. So a synthetic liquid fuel is a hydrocarbon fuel, similar to conventional petrol and diesel, but it’s not derived directly from oil. This is not a new process. The original discovery by two German chemists called Fischer and Tropsch goes back nearly a hundred years. This originally converted coal by a multi-step process into liquid fuels like petrol and diesel. This was later commercialised in Germany and then more globally both in South Africa and beyond. So, this is a quite remarkable process for converting coal into petrol and diesel, more at a molecular level. The way you’d think about this, rather than oil refining which breaks up large molecules into the smaller molecules our engines burn, this goes in the opposite direction. So it takes very small molecules and stitches them together to give you the right structure for liquid fuels. Katie - And why is it better to make fuels from coal, say, than current methods of getting petrol? Robert - If you look back in history to the synthetic liquid fuels it’s more about necessity being the mother of invention. So in both of the regions where this technology was first pioneered there were ample coal deposits, but no oil. So the conventional routes weren’t open to them so they found a way to convert coal into petrol and diesel. The attraction of these synthetic fuels is they’ve got inherently low sulphur. 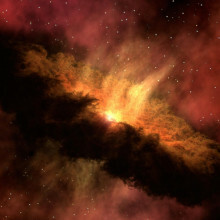 Sulphur is one of the key contaminates that cause environmental issues. The other thing that we’re increasingly aware of are particulate formation by engines. These synthetic fuels are very low in the compounds which lead to the formation of particulates. Katie - Step-by-step, can you take us through the process of what happens? Say I’ve got my coal, or my biomass, or my natural gas as my carbon source, how do I get petrol out the other end? Robert - There are three main steps in the synthetic fuel process. The first one is taking your carbon source, whatever that is, and converting it into the correct mixture of carbon monoxide and hydrogen called synthesis gas. The second step is really the catalytic step. The carbon monoxide and the hydrogen is passed over a catalyst at elevated temperature and pressure to be stitched together to give you the molecules that you need as the fuel. In a third step, you finally do some product treatment to give you the diesel and petrol that car engines require. Katie - So why do we need this catalyst for the second stage? Robert - A catalyst speeds up the rate of a chemical reaction. If you didn’t add a catalyst, the reactions would require massively high temperatures or very long times, neither of which would make this commercially viable. The other thing the catalyst does; it controls the selectivity so it gives you some control over the products that are made. And again, what that means is it’s both energetically and materially efficient so you get from A to B in the most cost effective and environmentally sound way. Katie - Oh I see. So if you put carbon monoxide and hydrogen together in a room they might not necessarily do much, but the catalyst, well, catalyses the reaction? Robert - Exactly. You would wait a long long time for carbon monoxide and hydrogen to react if you just left them alone. Katie - What typically is the catalyst used in this reaction? Robert - Typical catalysts are based on cobalt or iron. Katie - And how much do these sorts of materials cost? Robert - That varies very much from process to process. Their cost contribution to the overall process will be very low, and would have to be to be economically viable. So even though some of them are based on very precious metals, if you get an efficient enough catalyst then the actual cost is low. So one of the key defining factors about a catalyst is its so-called “lifetime,” so how long it will perform at the level you want it to. perform at. Katie - And is this still being used today? Robert - It is still being used. The beauty of a synthetic fuel process is it doesn’t really matter; the original form of carbon that you feed to this process. So as I say, the historical background was using coal but you can also use natural gas. And, in the future, it’s possible to use other raw materials, so waste biomass has the source of carbon to make synthetic fuels. Katie - So household food waste could be your carbon source for this process? Robert - Yeah, potentially that is a way. Anything that has carbon in can eventually be turned into synthesis gas. The question about the economic viability of that is critically important. Too expensive, they won’t get taken up by consumers and, therefore, they won’t have any environmental benefit. Katie - Given the concern over climate change; even the recent IPCC report, could carbon dioxide itself be used as a source for this process? Robert - Potentially, yes. There are many people working on the conversion of carbon dioxide into liquid fuels and that’s a challenging catalytic problem. Katie - Do you think the future of these synthetic liquid fuels is quite promising? Robert - We have to recognise that we’re in a transition period for energy. We increasingly see electric vehicles and their growth is rapid, but the number of electric vehicles is small. So we need to manage the transition to some future beyond hydrocarbon fuels, and what we can do in the meantime is to make the cleanest fuels we can. I think synthetic fuels could find application where other energy vectors are difficult to see. So, for instance, air travel: people are talking about electric planes but, for the foreseeable future, they’re going to run on liquid fuels. So there’s an opportunity there to make sustainable aviation fuels and catalysts are important both currently, and perhaps increasingly, going forward. New catalysts containing individual metal atoms can break strong carbon-fluorine bonds found in stable pollutants accumulating in humans, wildlife and nature. 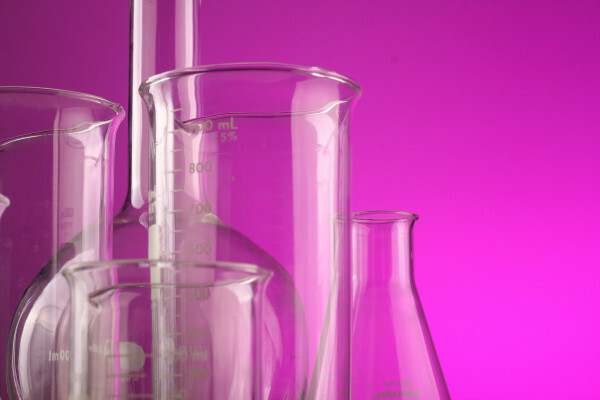 What can catalysts do about clearing up harmful chemicals? Carbon-fluorine bonds are some of the strongest in the world and they are found in lots of products that we use everyday like when frying food, a carbon-fluorine coating on the frying pan stops the food sticking. But the problem with these strong bonds is that we cannot break them so they are building up in the environment and some of these chemicals are really toxic. Recently a group of researchers in the US have managed to make a new type of catalyst that could break down toxic carbon-fluorine components in materials and pollutants building up all around us. Katie Haylor spoke to Dr Eli Stavitski, from the Brookhaven National Laboratory who was involved in the project. Eli - You might remember that ozone hole scare dating back to the 80s. The primary cause of this was so-called chlorofluorocarbons that were used in refrigerators and air conditioners. They were eventually banned and replaced by other materials containing fluorine which are less harmful to the ozone layer, yet they’re many times more potent as greenhouse gases compared to carbon dioxide. The specific chemical we targeted in our work is used worldwide in coatings and the current contamination levels are truly troubling. And that, together with the carbon-fluorine bond being one of the strongest, really made us look for new ways to clean up this mess. Katie - Okay. And what is the chemical that you've been looking at? Tell us a bit about it. Eli - It’s a perfluorooctanoic acid. This is a long chain of carbon atoms all connected to the fluorine bonds used in many products that we encounter every day. In the process of preparing them there is a contamination arising from the process. Katie - So what kind of products is it in? Eli - This is used in firefighter’s foams, for the coatings on your pans and skillets. In the coatings that protect different products so it’s really widely used. Katie - So do we have any reason to be worried about the non-stick pans then? Eli - Oh no. The pollution occurs in the process of the preparation. Katie - Oh, I see. Can they be harmful in any other ways? Eli - The materials that contain carbon and fluorines, such as perfluorooctanoic acids and related compounds, are suspected that at the moment to cause cancer and reproductive effects and this is why the agencies around the world are looking at them to determine how harmful they are. Katie - So there could be potential health impacts, as well as environmental impacts, and crucially, these bonds can’t easily be broken so these compounds are sticking around for a long time wherever they end up. Now you’ve been trying to tackle this problem haven’t you, so tell us about these catalysts, these so-called single atom catalysts? Eli - Yes. We managed to find the means to break these carbon-fluorine bonds using single atom catalysts. Ultimately, you want your catalyst particles to be very small and this is because the reactions - catalytic reactions - occur on the surface of the catalyst, so you could make nanoparticles out of them. But, ultimately, you can go one step further and break them into single atoms. Breaking large pieces of catalysts brings about very unique properties. If you think about a golden ring on your finger, it’s as chemically inert as it goes, but when it’s broken into the pieces of a billionth of a metre it will turn over many chemical reactions at very high rates. The ultimate goal here is to arrive to a single atom because that’s how we will optimise our catalytic activity. Katie - So you can take a metal that on a macro scale would be pretty inert, and by changing the scale at which you’re operating, the properties change? Eli - That’s exactly correct. And the ability to break the catalyst into a single atoms brings about even more new functionalities and new useful properties. Katie - What material are we using here? Eli - In this work, we were using platinum which is a precious metal. Platinum breaks hydrogen molecules into atoms that are very very active and those atoms are those that cleave the carbon-fluorine bond. But, ultimately, there are many people on this planet right now working on single atom catalysts of all different metals. Katie - So looking forward to the future then, what could these single atom catalysts do for us? Eli - Oh, there are many processes, many emerging reactions where single atom catalysts show amazing activity. But the catalyst we developed, it still contains precious metals and we really have to look and to find the useful functions of abundant, less expensive materials such as iron, cobalt and such. But, ultimately, single atoms are not the final goal, we’re just starting to manipulate single atoms of different kinds, arranging them in ensembles of two, three or maybe more where each atom will perform its own unique function. Katie - Wow! So it sounds like there’s a lot of potential then and a lot of work that still needs to be done? Eli - Oh yeah. This field is in its infancy and I’m so looking forward to being a part of it. 53:45 - How harmful is second-hand smoke? New legislation means that smokers see a graphic health warning on cigarette packaging as constant reminder of potential side effects. But are the non-smokers at risk of these too? It's time for Question of the week. And this week Tamsin Bell’s been firing up on this question from Bethany. Tamsin - In several countries around the world, new legislation means that smokers see a graphic health warning on cigarette packaging as constant reminder of potential side effects of smoking. But are the non-smokers at risk of these too? We asked Stefan Marciniak, Professor of Respiratory Science at the University of Cambridge..
Stefan - This is a good question, and as with so many good questions the answer isn’t straightforward. It’s both yes and no. Passive smoking, also called second hand smoking, is recognised by the World Health Organisation as a major global health problem. Every year nearly seven million people around the world will die from smoking-related illnesses. Six million of these are smokers - because half of all smokers will die of a smoking related disease such as cancer, heart attack, stroke or emphysema. But the remaining one million deaths are in non-smokers. That means that roughly 1 in 7 smoke-induced deaths is due to secondhand smoke! Cigarette smoke contains more than 4000 different chemicals – of these we know for certain that at least 250 are toxic and at least 50 can cause cancer, such as arsenic, lead and cadmium. There is no safe limit to cigarette smoke exposure. Cigarette smoke comes in two forms: mainstream smoke (which is the smoke drawn in to the mouth of a smoker) and sidestream smoke (which is the smoke coming off the end of a smouldering cigarette). Second hand smoke is a mixture of exhaled mainstream smoke, mixed in with sidestream smoke. 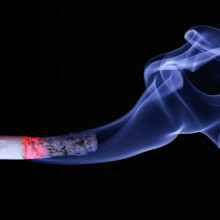 In a sense, it is true that side-stream smoke, often experience by bystanders, is “worse” because it contains much more carbon monoxide and other toxic chemicals, such as ammonia and nitrosamines compared to mainstream smoke because it hasn’t gone through the filter at the bottom of a cigarette. However, a passive smoker will be inhaling more dilute smoke compared to an actual smoker, so the smoker will still receive a larger dose of the toxins and in that sense the passive smoker isn’t actually coming off “worse”. But we mustn’t underplay the dangers of passive smoking. Globally about a third of the deaths each year caused by secondhand smoke are in children. In the UK, passive smoking causes around 165,000 new cases of diseases in children each year, including asthma, pneumonia, and tragically, even sudden infant death syndrome. Even the unborn child is at risk -- pregnant women who are exposed to secondhand smoke are more likely to have low birth weight babies and these babies are more likely to be born prematurely. This is why since October 2015 it has been an offence to smoke in a car with a child, and is also the reason smoking isn’t permitted in workplaces or social spots like bars and pubs. So, to summarise, if possible, you should try and stay away from any type of cigarette smoke! Next Is second hand smoke more dangerous than smoking a cigarette?